Google talk official client developed by RIM for their BlackBerry smart phones is the best IM chat client available out there in the BlackBerry App World. 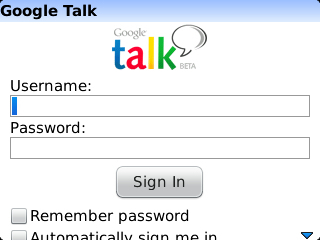 As we know, Google talk is the IM chat service from Google which facilitates real time web chat. Google talk clients have been popular among the mobile devices as an alternative for messaging service so as the case with BlackBerry. The application provides all the features that one could expect from a chat client that is chat with emoticons, block offline contacts, save chat history etc etc but the only thing which lack according to me is that this application never switches the user to idle status which I think might be updated in near future. The app is pre-loaded with the device along with Yahoo messenger and Windows Live messenger under the instant messaging column in OS 7 (don’t know about the previous ones because the first blackberry I have used is of OS 7). Else download it from the BlackBerry App World. Previous articleNews : BlackBerry Jam Asia 2012, registrations open!